“If anyone would come after Me, he must . . follow Me.” Mark 8:34 NIV. Religion is complicated; spirituality is simple. A healthy, robust spiritual life is possible for you. Certainly, that requires intention, attention, and priority. Spiritual life is not for the casual soul; it is achieved purposefully. Spirituality is not as difficult as some people often make it out to be. Some assume, or have been wrongly taught, that spiritual life is about religious rules, regulations to learn, duties to perform, strict laws to obey, or religious protocols to be observed. Religion is complicated; spirituality is simple. The prophet, Isaiah, described the simplicity of spirituality for the sincere seeker, “Whoever walks the road [called the Highway of Holiness], although a fool, shall not go astray.” Isaiah 35:8. It is not about your intelligence; it is about your obedience. In the New Testament, people frequently asked to be Jesus’ disciple. On other occasions, Jesus invited people to be His disciples. Either way the choice remained theirs to make, just like your invitation to be His disciple is always yours to accept or decline. Following Jesus’ baptism by John, Jesus began calling for men to be His disciples. Some readily did so; others reluctantly declined. Jesus’ invitation was simple; still is. “’Come, follow Me,’ Jesus said.” Read Mark 1:16-20 NIV. Their response to His invitation was immediate. “At once they left their nets and followed Him.” In Jesus’ company, less and less of your old life compares with the new life you receive. Read Psalm 16:11/2 Corinthians 5:17 NIV. Godly choices aren’t simple to make; they are simple when made. Jesus wrapped profound and eternal truth in everyday stories, comparing one’s discovery of the Kingdom with a man finding buried treasure in a field and a merchant finding an incomparable pearl, and both selling all they had to possess what they once never imagined could be theirs. Read Matthew 13:44-46 NIV. When you follow Jesus, He gives you a life beyond all you could previously imagine or hope to obtain. See Romans 15:5-6 NIV. Jesus alone is the answer to every question and fulfillment of each desire. If you are following Jesus, your life can be an example and encouragement to others who want to follow Him, as Paul encouraged the Christians at Corinth, “Follow my example, as I follow the example of Christ.” 1 Corinthians 11:1 NIV. Seeing a practical model of someone who is faithfully following Jesus helps tremendously. I am thankful for every Godly friend and spiritual mentor – Kenny, Campbell, Des, Don, Andrew, Rick, too many more to name really – who provided me with living examples and personal encouragement of being a Christ-follower. I continue to learn how to follow Jesus by watching them follow Him. Jesus wrapped profound and eternal truth in everyday stories, comparing one’s discovery of the Kingdom with a man finding buried treasure in a field and a merchant finding an incomparable pearl, and both selling all they had to possess what they once never imagined could be theirs. Read Matthew 13:44-46 NIV. When you follow Jesus, He gives you a life beyond all you could previously imagine or hope to obtain. Jesus alone is the answer to every question and the fulfillment of every desire. Yes, there are sacrifices to make; there are things to abandon; there are new loyalties and a cross to embrace. “If anyone would come after Me, he must deny himself and take up his cross and follow Me. For whoever wants to save his life will lose it, but whoever loses his life for Me and for the Gospel will save it.” Read Mark 8:34-38 NIV. If you are following Jesus with a whole heart, He has much more ahead for you than what you ever leave behind. At the heart of spiritual life is your response to Jesus’ simple invitation to follow Him. “Seek first His Kingdom and His righteousness, and all these things will be given to you as well.” Read Matthew 6:31-33 NIV. Today, my prayer for you is, “May the God who gives endurance and encouragement give you a spirit of unity among yourselves as you follow Christ Jesus, so that with one heart and mouth you may glorify the God and Father of our Lord Jesus Christ.” Romans 15:5-6 NIV. “Be generous on every occasion.” 2 Corinthians 9:11 NIV. Generosity is in the magnitude of your sacrifice more than the measure of your gift. Generosity is a lifestyle, not an occasional benevolence. I have observed that generous people are happier than individuals inclined more to self-interest. Generosity is expressed in much more practical ways than merely money and material things. Generosity encompasses one’s attitudes toward others, communications to and about them, and benevolent actions on their behalf. Generosity is your practical benevolence offered to others, not earned by them. Today’s culture proposes a false narrative that, “Having is the way to happiness.” Don’t believe it. The Bible principle is; “Giving is the path to happiness.” Solomon affirmed this truth; “One man gives freely, yet gains even more; another withholds unduly, but comes to poverty. A generous man will prosper; he who refreshes others will himself be refreshed.” Proverbs 11:24-25 NIV. When generous, you become both benefactor and beneficiary. Read Luke 6:37-38 NIV. The good you do comes back to you; release is the key to increase. God Himself – Father, Son, and Holy Spirit – initiates the pattern for a generous life. “But when the kindness and love of God our Savior appeared, He saved us, not because of righteous things we had done, but because of His mercy. He saved us through the washing of rebirth and renewal by the Holy Spirit, Whom He poured out on us generously through Jesus Christ our Savior.” Titus 3:4-6 NIV. Salvation is the most charitable expression of generosity ever given and a sacrificial model of the grace which is to be expressed through the lives of those who have received such favor. “He who did not spare His own Son, but delivered Him up for us all, how shall He not with Him also freely give us all things?” Romans 8:32. And Jesus stressed the practical, spiritual obligation of such holy benevolence in His words, “Freely you have received, freely also give.” Matthew 10:8. Generosity is a lifestyle, not an occasional benevolence. David, beloved King and Psalmist, recognized the essence of generosity, “Everything comes from You, and we have given You only what comes from Your hand.” 1 Chronicles 29:14 NIV. A generous life includes much more than what material things you have and give, and is best expressed through regard for others, conversations to and about others, kindnesses shown, attitudes, behavior, availability, and your time or practical assistance shared with others. Munificence abides in your heart before it abounds in your everyday life. Read 1 Timothy 6:18-19 NLT. Today, my prayer for you is that you discover the joy of sharing the lavish grace of God with others. “Like clay is in the hand of the potter, so are you in My hand.” Jeremiah 18:6 NIV. Remain in God’s hands until His work is complete and His plan evident. People are so impatient; we expect everything to be immediate. What we want, we want now. You must learn that whatever is worth having is worth waiting for. And whatever is worth waiting for is worth the time and effort that necessitates. As it pertains to your spiritual life and development, your best efforts alone will not achieve all God intends for you. Try as diligently as you might, your efforts will fall short. What needs to happen in your spiritual life requires God for its accomplishment. Yes, there are spiritual disciplines to which you must steadfastly commit yourself and be diligent in doing so. “Make every effort to add to your faith goodness . . knowledge . . self-control . . perseverance . . Godliness . . brotherly kindness, and love.” 2 Peter 1:5-8 NIV. Ultimately, your spiritual growth requires the power of the Holy Spirit indwelling and working within you. Spiritual maturity occurs as you rest in God’s hands fully and continually, to work as He wills. Jeremiah visited a potter’s shop and observed the potter at work when, “the clay was marred in his hands; so the potter formed it into another pot, shaping it as seemed best to him . . like clay in the hand of the potter, so are you in My hand.” Jeremiah 18:1-4/6 NIV. The work in His hands requires more than the quality of the clay; the ultimate outcome is due to the vision, diligence, and skill of the potter. Impurities or failure may temporarily mar God’s design and delay His intention, but all is not lost. The God who by His mere words created a world out of nothing, whispers, “Trust Me.” Remain in God’s hands until His work is complete and His plan evident. The process may seem dizzying at times and the purpose unclear, but rest in your Creator. “What we will be has not yet been made known . . but we shall be like Him for we shall see Him as He is.” See 1 John 3:1-3 NIV. That’s God’s promise. God knows exactly what He is doing. You are a work in progress, while He faithfully conforms you into the image of His Son, Jesus, as you have asked Him to do. “We know that in all things God works for the good of those who love Him, who have been called according to His purpose. For those God foreknew He also predestined to be conformed to the likeness of His Son.” Romans 8:28-29 NIV. That seems well beyond your finite ability to comprehend, but true nevertheless. I am not yet what I will be nor am I what I once was. “Being confident of this, that He who began a good work in you will carry it on to completion until the day of Christ Jesus.” Philippians 1:6 NIV. When I was a young pastor with few skills and many uncertainties, God spoke His Word to my heart, “The One who calls you is faithful and He will do it.” Read 1 Thessalonians 5:23-24 NIV. Of that truth, I have never had reason to be uncertain. Across the years, I continue to be strengthened by the promise of His faithfulness. Read 2 Timothy 3:16/Hebrews 13:20-21. You are God’s unique design fashioned for His service and glory. Participate and cooperate in the grand process that is called spiritual life. Really, this life is but prelude to life, eternal and incomparably glorious. “Eye has not seen, nor ear heard, nor have entered into the heart of man the things which God has prepared for those who love Him. But God has revealed them to us through His Spirit.” 1 Corinthians 2:9-10. Today, my prayer for you is that the lasting impressions on your life are His alone. 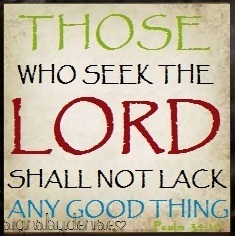 “Those who seek the Lord lack no good thing.” Psalm 34:10 NIV. There is no lack for those who seek God with a whole heart. When a sales clerk asks, “Can I can help you,” most shoppers answer, “Just looking.” You may be just shopping because you don’t yet know specifically what you are looking for. It is essential to know what you are seeking for in life. Or maybe you are “just looking,” hoping you will stumble upon what satisfies? Life is more fruitful when you are a seeker “on a mission,” knowing what you want and where to find it. That seems a metaphor for life. I observe three different kinds of people. In life, there are shoppers. Some people are just shopping. They just wander, having a general idea of what they want, but not really knowing where they will find it. Some know they are looking for something, but just haven’t decided exactly what that is yet. So people try this and try that, sometimes successfully, but often not. People keep looking, or just give up, and accept what they have; that’s sad and unnecessary. In life, there are seekers. Some are seeking right things – success, satisfaction, meaning, belonging, or purpose – but looking in all the wrong places, trying in all the wrong ways. Some are seeking things that don’t satisfy, such as influence, approval, admiration, applause, or achievement; there is nothing wrong with those, except when you do so for the wrong reasons. Others seek lesser things, such as power, wealth, pleasure, fame, or recognition for all the wrong reasons as well. Sadly, even when succeeding, they fail. In America, we can take a lot of things for granted; we seek for luxuries while much of the rest of the world pursues necessities, seeking survival and safety – survival from starvation or disease and safety from political, racial, or religious violence and wars, without knowing there is a Savior who died for their sins, and a Father Who wants to bless and provide for them. Read 1 John 4:11/John 3:16-17. Most importantly, let us be seekers after God. “Those who seek the Lord lack no good thing.” Psalm 34:10 NIV. Meditate on that wondrous promise. The Almighty God said, “I love those who love Me, and those who seek Me diligently will find Me.” Proverbs 8:17 NKJV. That’s the company in which I want to be found, not casually looking but actively, aggressively, and obediently seeking all that God offers. “You will seek Me and find Me when you seek Me with all your heart.” Jeremiah 29:13-14 NIV. Spiritually, are you a shopper or a seeker? There is no lack for those who seek God with a whole heart. Seek for God in the manner that God seeks for you – intently,lovingly, and enduringly. Read Jesus’ Parables of the lost sheep, lost coin, and lost son. Luke 15:1-31. Consider these practical admonitions from Scripture. “Seek His face always.” Psalm 105:3-4 NIV; “Seek Him with all your heart and soul.” Deuteronomy 4:29-31 NKJV; “Seek first His Kingdom and righteousness.” Matthew 6:33-34 NIV; “Seek, and you will find.” Luke 11:9-1o; “Seek those things which are above, where Christ is.” Colossians3:1-2; “Seek the good of others.” 1 Corinthians 10:24 NIV. The Bible offers both a promise and a warning, “He who comes to God must believe that He is a rewarder of those who diligently seek Him . . Seek the Lord while He may be found; call upon Him while He is near.” Hebrews 11:6/Isaiah 55:6. Today, my prayer for you is that you will find all for which you seek, when you seek for God. When shared with a friend, sorrows are divided but joys are multiplied. Life can be lonelier than it’s meant to be. Loneliness results from a lack of meaningful and mutual connections with others. You can feel lonely in the company of a crowd but loved in the companionship of a friend. Godly companionship is nurturing to the soul in good times and nurses the wounds in difficulties. “As iron sharpens iron, so a man sharpens the countenance of his friend.” Proverbs 27:17. The Bible tells the story of Naomi. Read Ruth 1:1-22 NIV. In a famine, Elimelech and Naomi, with their two sons left Bethlehem for Moab seeking a better life. Elimelech died and their sons married Moabite wives, Ruth and Orpah. Within 10 years, both sons died, leaving their Moabite wives as widows. Tragedy left Naomi and her daughters-in-law with a shared sorrow. As often happens, in their common dilemma they discovered a shared life. In Jesus’ parable about the lost sheep and the lost coin, each story concludes with these words, “When he has found it, He calls together his friends and neighbors saying, ‘Rejoice with me.’” Luke 15:6-7. When shared with a friend, sorrows are divided but joys are multiplied. Longing to return home to Bethlehem after her tragic loss in Moab, Naomi urged Ruth and Orpah to remain in Moab. But Ruth voiced her sense of Godly connection with Naomi. What began as incidental became personal and mutual. In their shared experience, God connected their hearts in a way they could not have anticipated. Ruth’s response to Naomi was definitive, “Where you go, I will go; where you stay, I will stay; your people will be my people, and your God my God; where you die, I will die.” Ruth 1:16-17 NIV. Their destiny became linked in Godly ways of mutual affirmation and blessing. Godly connections are engendered by recognition that God’s purposes envelop a common future. I love the providential occasion of their return to Bethlehem, “They came at the beginning of the barley harvest.” Ruth 1:22. Naomi left for Moab in a famine but in the loving benevolence of God they returned from Moab at the time of harvest. Maybe your harvest is just ahead also. “A man who has friends must himself be friendly.” Proverbs 18:24. Ruth affirmed her conviction and personal commitment, in the most practical way. In Ruth’s words are relevant truths about mutual connections. (1) Connection requires proximity and priority of time. “Where you go, I will go; where you stay I will stay.” Self-absorption and busyness minimize meaningful connection. Make time to be together purposefully and take the importance of that seriously. (2) Connection includes room for others. “Your people will be my people.” Exclusiveness and possessiveness diminishes the life God means to flow freely. (3) Connections occur when God is at the center. “Your God will be my God.” Connections require a bond with spiritual orientation and purpose. 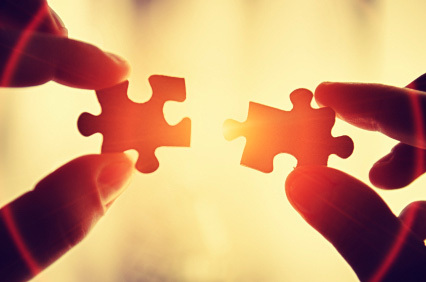 (4) Connections require significant commitment. “Where you die, I will die.” Friendships can grow and deepen over a lifetime; stay committed to them. Value and protect meaningful connections where God is directing and blessing. I am privileged to enjoy such friendships, and hope that I can be such a friend. Though there must be some things enjoyed in common, they are usually not the more superficial things you might think, such as age, social status, or personality. I cherish friendships with people both older and younger, of diverse personalities from mine, of both modest means and wealth, and of varied experiences and interests. But there is one very important thing that we share in common that strengthens the life connection we enjoy – our common faith and commitment to Jesus. Lasting connections will have a spiritual commonality with people on a journey whose destination is as yours. I love the providential timing of Naomi’s return to Bethlehem, “They came at the beginning of the barley harvest.” Ruth 1:22. Naomi left for Moab in a famine but in the benevolence of God they returned from Moab at the time of harvest. Maybe your harvest is just ahead also. Today, my prayer for you is that you provide others the company you enjoy.